Along with generous amounts of khachapuri, the other item that I almost always order in a Georgian restaurant is lobio. It comes different ways. This particular recipe is fairly standard. This recipe is a perfect example of how the Georgians can take something as ordinary as kidney beans and turn them into something wondrously exotic. If your friends are deathly allergic to walnuts, you can leave them out, and the dish doesn’t suffer too much. This dish can be served either at room temperature or hot. The hot version usually has the consistency of a stew and is often made with hot pepper. 1. Simmer the beans in water together with the chopped onion to soften. Then drain and partially mash in a bowl. 2. Add the cilantro, parsley, walnuts, garlic, spices, and about ¼ cup of red wine vinegar, and stir to combine. Add more vinegar as needed to make the beans slightly tangy. Adjust salt to taste. If the mixture is still very thick, add a little water to loosen it up. 3. 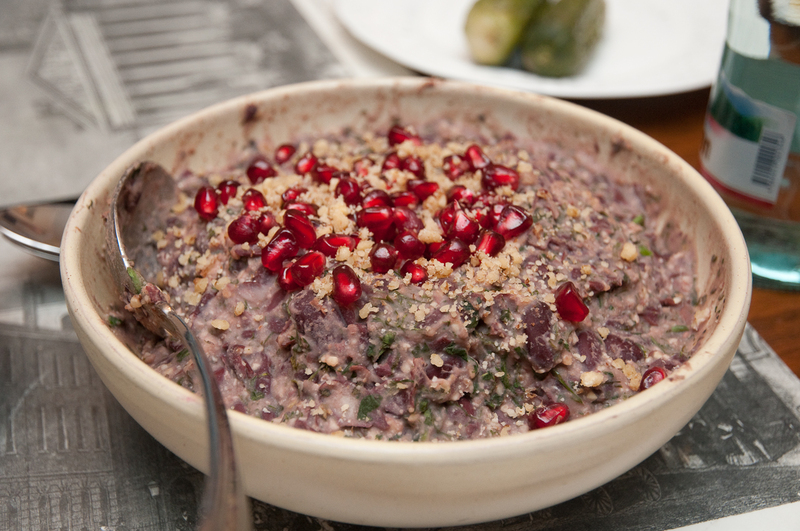 Serve liberally garnished with pomegranate seeds. This entry was posted in Appetizers, Salads and Sides, Vegan, Vegetarian and tagged Beans, Georgian, Nuts by Baron. Bookmark the permalink.